My first Apple was an Apple //c that I got in early 1984, right after it launched. It began my still-quite-saucy love affair with the Apple II and was just the first of many different Apple II systems I’d come to own over the years. Now, I’ve moved through many different systems since then and, as many of those years were in my pre-professional days (read: no money) and also since I didn’t start actually collecting until around 2000, I rarely had more than one computer system at a time. I’d sell system x to basically fund system y. One of the rare instances back in those days where I had more than one system was in 1987 when I was driving a sweet Atari 520ST setup. I’d recently sold a well-expanded Apple IIe system to jump up to the Atari and, so, in the closet went my boxes of Apple II disks while the Atari took center stage. But, after a while, I really missed playing those Apple II games. I didn’t want to drop the Atari, but I didn’t have the cash to grab an Apple II, either. And that’s when I bought a Laser 128. Video Technologies (or VTech) brought the Laser 128 to market in 1986. 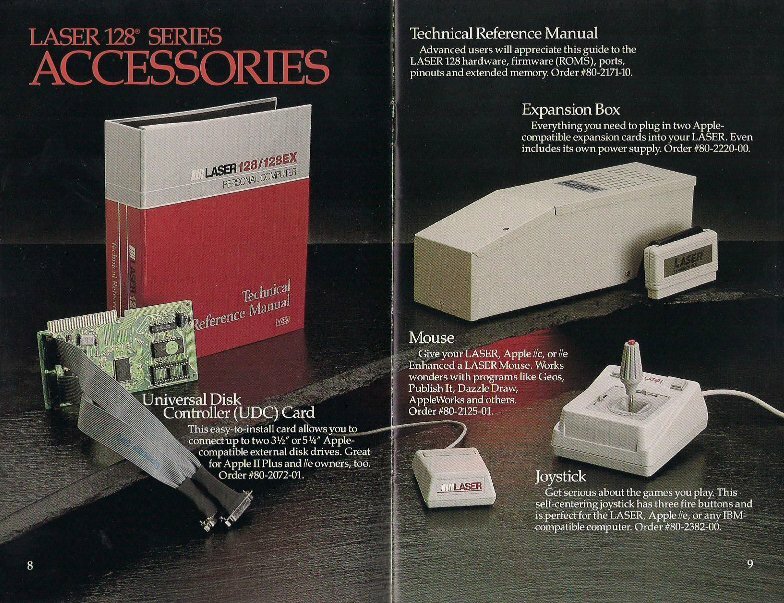 It was an Apple //c clone that was a follow-up to their Apple ][+ clone, the Laser 3000 (which I also owned, but only for a few days — that’s another story). It could be had for $395, which is far less than Apple was charging for the //c or IIe at the time. The Laser 128 featured all of the integrated ports of the Apple //c, but it didn’t stop there. The machine also sported a parallel printer interface (Apple was serial-only), both digital and analog RGB out, as well as a IIe-style expansion slot on the side of the unit to which a 2-slot card cage could be attached (slots 4 and 7), allowing for much greater expansion flexibility than the Apple //c and many more built-in features than the Apple IIe. It’s was something of a “best of both worlds” situation. I grabbed the Laser 128 and held my breath, expecting something of a compromised, rough ride. But what I experienced was nothing close to a compromise, but perhaps the best 8-bit Apple II experience I’d ever had. The machine ended up being 99.8% compatible with the //c, and I was so happy with it that I added the card cage and a Mouse Systems A+ optical mouse to the machine. In the card cage went a Mockingboard C soundcard and the Prometheus ProModem 1200A I’d been holding on to, a relic from my 1986 Apple IIe system (and my first modem). I never encountered any program that would not run perfectly on the machine and I fully enjoyed the enhanced sound and telecommunications capabilities that the expansion box enabled. It was a wonderful system that really added a lot of fun to my day-to-day computing experience way back when. 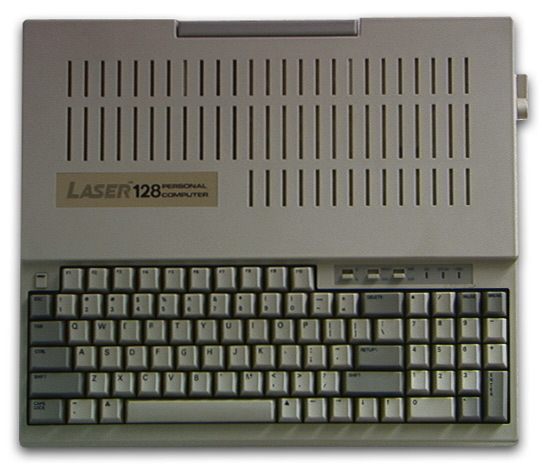 The machine I owned was the first iteration of the Laser 128. It was something of an odd looking beast. A Millennium Flacon, of sorts. Some time later, VTech released a more stylish unit in the form of the Laser 128 EX and EX/2, the latter featuring a processor accelerator (3.6MHz vs 1.02MHz) that caused it to eventually push Apple to release the accelerated Apple //c+. The high school I attended bought a batch of Laser 128 EX units to fill a “writing lab,” and I am not exaggerating when I say that at least half of them gave up the magic smoke at some point — and I mean that literally. The engineering quality of those machines was highly suspect. I never had a lick of trouble with my original Laser 128, though — and it got some serious use. A big part of the appeal of the machine was the whole “I’m getting away with something” feel that it delivered. But, according to the courts, VTech was not “getting away with” something; they reverse engineered the Apple II ROMs and legitimately licensed Applesoft BASIC from Microsoft — so they were immune from the Apple law suits that did come their way. 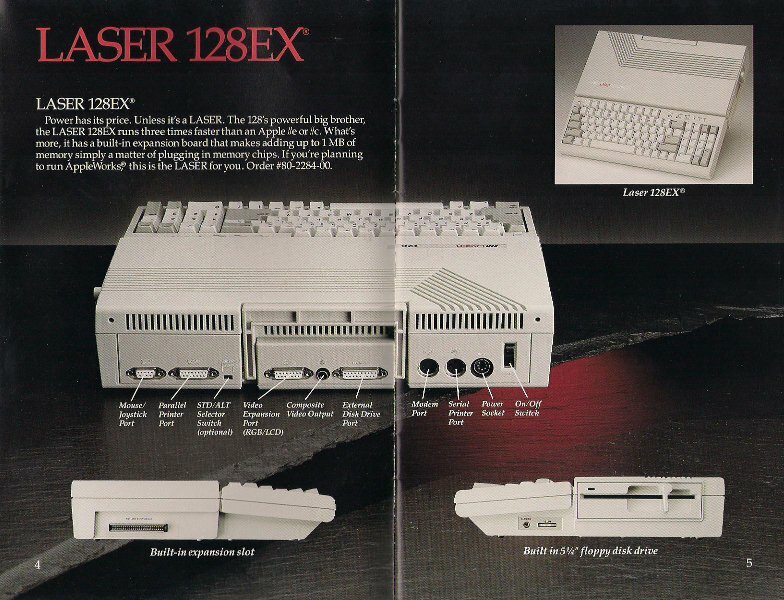 The Laser 128 was the only 100% legal Apple clone ever sold. I was using a fully expanded “Apple II,” but there’s no way I could have afforded an actual Apple at the time to serve as a secondary computer. It was great! It would probably be silly for me to try and source a Laser 128 setup for my own Byte Cellar, owning an Apple IIgs, a IIe, and a //c as I do. But a part of me wants to. It was a great machine at the right time for me, and I imagine I’m not the only one who had a whole lot of fun with this non-Apple. A short time later, VTech started selling low-end IBM PC clones in the Laser 128 form factor but, in time, backed out of the clone business entirely. The company is currently focused on electronic toys for kids. My daughter Rory’s first computer was a $75 VTech cartridge-based, battery-operated, kid-friendly unit that hooks to the living room TV with orders of magnitude more horsepower than even the Laser 128EX/2. My family upgraded from an Apple //+ to a Laser128EX, and it was indeed a vastly superior experience to the Apple //c machines my friends had. I was a great computer with a lot of unsung features like the variable speed CPU, and the ability to put an internal RAM disk of up to 1MB. I did the latter, and it was a godsend for working with large files or batches of files. 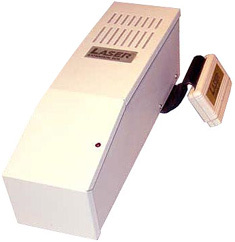 I used to have a Laser 200 back in the 80’s, and that machine also “gave up the magic smoke” eventually. Never happened with any of my other computers. Did VTech choose low quality components and/or risky engineering decisions to cut costs perhaps? My good friend had one of these growing up, and we played the crap out of it. I always wondered why certain games wouldn’t work for it but would work on my IIe – now I know! I guess it wasn’t the poor generic version of the Apple II that I once thought it was. I had the early Laser 128 as well and the only thing I can recall acting oddly was a double-hires game from EA involving flying a saucer over water. The bug was that double-hires would show up as two different screens when it was double-buffered, which meant the Laser’s graphics could actually do 2x the resolution of the Apple //c. My first commercial programming was making a rudimentary paint program that exploited that bug in the graphics. Wow. I assume the game you are speaking of is Airheart by Dan Gorlin. I don’t recall problems with it — I feel certain I played lots of Airheart on the Laser 128. Hmm. Could it be a ROM firmware difference? Can you tell me more about this paint program? You were able to tap into a 1120-pixel-wide screenmode, effectively? No, the width remained the same but the vertical was doubled. You basically had 560×384, and Airheart on the early Laser 128 I had would draw alternating frames top/bottom due to double-buffering. I recently acquired a laser 128 from my instructor. I’m looking for a monitor and a power cord for it so I can test the repairs I made. Any ideas where to locate the components? eBay has power cords for these made by Dr. Steven Buggie. This reply might be a few years too late, but never know! As for a monitor, if you have a TV with a yellow video in port, you can use that. If you only have the red, blue, green ports, use the green to connect to and you should get your picture. I have a Laser 128, with the original box, cords, manual, flyer ads. Reply if you are interested. I am not too far from Seattle. 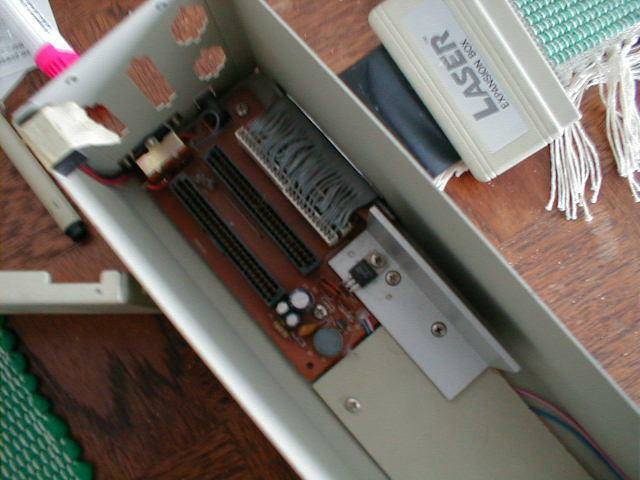 I also owned a early model Laser 128. Believe I got it in 1985. It was an upgrade from the Atari 800 which I also had at that time. I remember that my favorite game, Karateka, would not run on my Laser. I was bummed, for sure. I plan to pick one up when I see one come available on E-Bay. Thanks for the article!